"There are somethings that money can't buy; for everything else my salary is not sufficient". Mind it - don't add up the amount of money I syphon out or the amount of public money that I gulp down every now and then. I admit - in the past I even haven't spared cattle food or toilets, but those are not part of my regular income as they are highly inconsistent in coming around. So what my regular income is my salary which stands at mere Rs16000/- per month only and you know how tough it is to run a family with that amount in a place like Delhi. Along with that I also have to cater to the who's who of my constituency and to top it all I have to save a considerable part of it to pay the goons back home during election time. To sum it up, I also have to work for the common man among all these financial headaches. If anyone in this planet who deserves a pay hike are guys like us. Take a breath Mantriji. 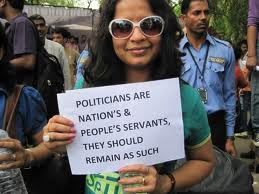 Points taken and most of us are convinced and ok with your salary hikes (It is not that we could have disagreed and stopped Pranab Da from announcing the hike). But on a smaller note, as you guys are getting payed from the money that I usually vomit during Feb & March months of every year, I think I have this much of liberty to have a little chat with you before I leave his excellency in peace to think about the well being of the nation. Thank you so much sir. If you promise to spare my life, I have to table a straight forward opinion of mine on this whole salary hike drama. Honestly you guys are not good enough and deserving to even get this Rs 16000/- that you are getting. You guys are so worthless that even Dawood Ibrahim would look a better asset for our country than you 500 odd bundle of jokers. One of the cunning most from your lot Lalu Yadav seems to have some other argument in favour of your demand. More than managing the financial headaches you mentioned he seems to have one or two ego going along. If you can, could you please elaborate that one rupee more than the secretary salary nonsense going around? I admit the potbellied high end babus are no different or less from you guys when it comes to corruption, foxing common mass and nefarious dealings, but still they are somewhere accountable for their acts. To begin with they are top notch bureaucrats of this country with some responsibility and accountability. They are at some point answerable to their bosses if not the public for whom they are designated servants. If not anything at least they have to attend their office on daily basis unlike you guys who only attend the parliament when you feel like or out of jail. Frankly, I see your demands of one rupee more pay than the babus is more absurd than expecting Rajnikanth to show respect to Newton's laws of Physics in his movies. Why don't you follow the general rule of corporates - if you are paid some X amount; the least your employer expects to get at least 3X in return, if not more. Unfortunately here the common man like me are your employers. Instead you guys gulp down a lot of our money (I don't know how many X) in the due course of your employment, let alone returning our 3X. As your esteemed friend has already started this comparison, lets have a little analysis on that. Can you throw some light on the qualification of you guys? Hang on - I know you guys have masters in corruption, unlawful acts, blabbering, foxing common man, trouble making, bunking your responsibilities and what not. Anything other than this in your resume would certainly help asserting your demand. Oh yes, I can understand. Take your time and can let me know in a month or two. I also have this hell of a confusion - you guys do have such strong hearts to make sure that our country does a nose dive in her development, growth and all other aspects. But when by any chance if our law enforcement agencies come calling on you, how you guys suddenly suffer from a bout of chest pain? How come all of you can have the convenient chest pain at the nick of time?More than anyone you should be thankful to your pre-programed and obedient heart for standing beside you at the time of need. I am equally confused on how you guys are capable of fringe ignorance and claim it a handy work of your opposition even if you guys were caught with money stuffed in your dhoti or clicked naked with a goat. Mantriji, have you seen those 5000 odd ex-servicemen agitating in Delhi for last couple of days? Are you aware of their demand of one rank one pension policy? Are you aware that our own war heroes returned their gallantry medals in protest? Do you know they are protesting for last 25 years for this? Isn't it strange that our heroes who once put their lives in danger, so that we can remain safe and guys like you remain busy in your crooked activities are on the streets begging for a very legitimate demand? Aren't our heroes more deserving than you set of seasoned buffoons? I know these are very uncomfortable questions. But I expect no politician, however astute he may be should duck these questions and move on.